How can Pacific women overcome barriers and achieve high political office? 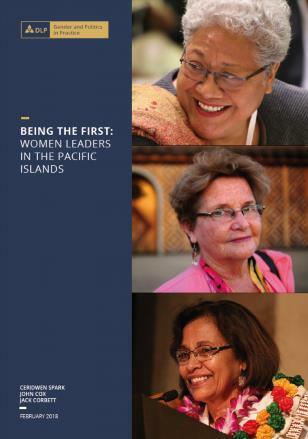 ‘Being the First’ profiles three women in the Pacific who have achieved this goal. build strategic networks with the international community. The reflections of these leaders can help understand how best to support women who are interested in formal political leadership in the Pacific. Being the First is part of a series of studies on ‘Gender and Politics in Practice’ (GAPP) that was launched at the 2018 Australasian Aid Conference. GAPP research explores how to tackle development challenges more effectively by bringing together politically informed and gender aware ways of working. Development challenges are complex because they involve power relations and politics, which shape the possibilities for, and pathways to, change. In all contexts and at all levels, these power relationships are gendered – they affect women and men differently, and often unequally. Making headway on complex development challenges therefore requires work that engages with power and politics and gender issues. But much analysis and action for change tends to look at these issues separately. The GAPP research draws on a literature review and 17 case studies from diverse sectors and contexts to highlight practical insights on integrating politically informed and gender aware ways of working for change. GAPP is led by the Developmental Leadership Program, which involves the University of Birmingham and La Trobe University, in collaboration with the Australian Government. Partner organisations include The Asia Foundation, Palladium, RMIT, Kings College London, UCL and the University of Southampton. GAPP is funded by the Australian Government through the Department of Foreign Affairs and Trade’s Gender Equality Fund and DFAT’s partnership with The Asia Foundation.